Jeffrey Deaver is back with another intriguing Lincoln Rhyme novel. And it’s one that will keep you guessing until the very end. This time we enter the world of the diamond business where, it seems, people will stop at nothing to achieve their objectives, even if it results in murder. The story starts off with a lovely, cheeky wink to William Goldman’s Marathon Man with the simple line, “Is it safe?” An ominous phrase if you have read the aforementioned book or have seen the John Schlesinger film. And, alas, in the very first chapter, a triple-murder takes place. The victims are a jeweller/diamond cutter and a soon-to-be-married couple. However, an apprentice diamond-cutter, Vimal Lahore, walks in on the crime scene and is lucky to escape with his life. Vimal finds himself on the run from the murderer. But why doesn’t he go straight to the police for protection? This is just one of the mysteries that lie within this book. But that is not all; a series of mini-earthquakes have been happening in New York, as outlandish as that may seem. Is it the mining company’s drilling that is causing the tremors or does it have something to do with the radical protestors led by Ezekiel Shapiro? To cap it all, Lincoln becomes involved in the trial of Mexican crime lord, Eduardo “El Halcon” Capilla. Rhyme keeps his involvement quiet but at what cost to his personal and professional life? So, as is plain to see, a lot is going on in this book. Amelia Sachs, Ron Pulaski, Lon Sellitto , they’re all here. In fact, there is quite a cast of characters in the 400-plus pages of the book. But Deaver manages to keep the narrative flowing and maintain interest despite various interludes to explain about things like diamond-cutting, duodecimal algorithms and even cryptic crosswords. He spends a lot of time on the sub-plot of Vimal Lahore and his complicated family life and the character of the Promisor which is the name that the killer becomes known by in the media. Peripheral characters are introduced and are affected by the action. After the horrible murder of William and Anna alongside Jatin Patel in the first chapter, the reader never knows who might live or die. It really leads to some anguished moments. 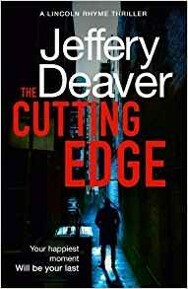 Inevitably, Deaver brings it all together and after drawing in the reader, delivers twist after twist, never letting up until the final chapter. Even then, he gives you a smack in the mouth. It is really top-drawer writing. The Cutting Edge is a truly engaging novel. I will be watching out for the next one!